Even if you aren’t about to go out and buy a state-of-the-art, high-efficiency heating system, it is still a good idea to hire a contractor to check out your system, perform regular tune-ups, and look for opportunities to realize substantial savings by boosting the efficiency and performance of your present system. In a few situations, it makes more economic sense to tune up or modify your existing system than to replace it. Oil-fired systems should be tuned up and cleaned every year, unless they operate on ultra-low sulfur fuel. Gas-fired systems should be checked every two years, and heat pumps every two or three years. Regular tune-ups should cut heating costs, and they also increase the lifetime of the system, reduce breakdowns and repair costs, and cut the amount of carbon monoxide, smoke, and other pollutants pumped into the atmosphere by fossil-fueled systems. The company that sells oil usually has trained technicians who can test your furnace or boiler, clean it, and tune it for optimum efficiency. Independent contractors provide this service as well. A complete tune-up may cost more than $100, but can reduce your heating bill from 3–10%. Some companies perform these services as part of a regular service contract. Check to make sure that all of the services listed below are included. The technician should measure the efficiency of your system both before and after tuning it up and provide you with a copy of the results. Combustion efficiency is determined based on one or more of the following tests: 1) flue temperature; 2) percent carbon dioxide or oxygen; 3) smoke number (oil); 4) carbon monoxide; and 5) draft. Carbon dioxide. Carbon dioxide is the primary end product of fossil-fuel combustion. Too little carbon dioxide indicates incomplete combustion. For an oil burner, the CO2 concentration should measure between 10 and 12%. For gas, it should be between 7 and 9%. If an oxygen reading is taken instead, it should be between 3 and 6% for oil systems, or between 5 and 7% for non-condensing gas systems. Smoke (oil only). Smoke indicates lack of complete combustion and is usually not present in gas systems. For an oil system, on a scale of 0 to 10, the smoke number should be no higher than 1. Carbon monoxide (gas only). Carbon monoxide (CO) indicates incomplete combustion. For safety reasons, recommended CO levels in the flue gas should not exceed 400 parts per million. Cleaning. Oil system parts to be cleaned include the burner (nozzle, electrodes, filters), combustion chamber, oil line filter, and flue pipe. For all systems, clean the heat exchanger surfaces. Oil nozzles and filters are often replaced rather than cleaned. Sediment should be removed from the boiler and steam lines; corrosion inhibitors may be added to the boiler. Adjustments. Air- and fuel-flow adjustments will be made based on the results of efficiency testing. The internal thermostat on the furnace or boiler (fan thermostat or aquastat) should be calibrated to turn on and off at the appropriate temperatures. Pumps and Fans. Pumps and fans should be inspected and lubricated if necessary. During a routine tune-up, a heating technician may recommend additional modifications to your heating system. All of these measures for boosting the efficiency of your furnace or boiler require a professional with the proper training and tools. Duct sealing. In homes heated with forced warm air, ducts should be inspected and sealed to ensure adequate airflow and eliminate loss of heated air. It is not uncommon for ducts to leak as much as 15-20% of the air passing through them. And, leaky ducts can bring additional dust and humidity into living spaces. Thorough duct sealing costs several hundred dollars, but can cut heating and cooling costs in many homes by 20%. A contractor can test your ducts to determine the extent and location of leaks. Accessible ducts are often sealed using mastic, which is applied to the outside of duct joints and other leak sites. A new alternative to mastic is aerosol-based duct sealing (“Aeroseal”). A machine connected to the ductwork blows a latex aerosol throughout ducts to seal leaks from the inside. This system can reach leaks in hard to reach or inaccessible spaces and effectively seals leaks up to 1/4" in diameter. Did You Know? About 20% of space conditioning energy is wasted through duct losses. Field studies demonstrate that aerosol-based duct sealing can reduce duct leakage by 80% on average. Reducing System Size. If you have an older oil-fired system, and you’ve added insulation, upgraded your windows, or tightened your house, chances are that your burner runs for only a fraction of the time, even in the coldest weather. When your heating system constantly turns on and off, its performance is like driving in stop-and-go traffic: you don’t get very good mileage. A simple way to reduce this waste is by decreasing the rate at which oil is fed into the burner. With oil systems, the service technician can install a smaller nozzle, which costs just a few dollars and can cut fuel bills by 5–10%. Nozzles are sized according to fuel-flow rates. The specification plate on your burner should include an acceptable flow range; an average range would be from 0.50 to 1.25 gallons per hour (GPH). Nozzle size should not be reduced more than 25–30% below the lowest firing range on the specification plate. Burners for steam systems should not be downsized. Draft reduction (oil only). The draft test will determine whether excess heat is being lost up the chimney. This problem is particularly common in systems that were converted from coal to oil. If the draft is too high, your service technician should install a barometric damper in the flue pipe. This may cost from $20–100, but can reduce fuel use by 5% or more. If a barometric damper is already there, it may simply need adjustment. New oil burner installation. If you have an old, inefficient oil burner but are not ready to replace the whole thing, have a flame-retention burner installed. It will mix oil and air more thoroughly, operate with less airflow, and send less heat up the chimney. In addition, a flame-retention burner will block airflow through the burner when the system is not running, reducing heat loss up the chimney. Flame-retention burners cost $400–600, depending on whether a new combustion chamber and controls are needed. A properly sized flame-retention burner with reduced nozzle size should save 10–20%. You’ll do even better, though, replacing the whole furnace or boiler with a state-of-the art high-efficiency model. Outdoor reset or aquastat (hot water boilers only). An aquastat regulates boiler temperatures, keeping the water within a prescribed temperature range, usually around 180°F. Unfortunately, it will keep the water just as hot even when there is little need for heat, such as during spring and fall months. A modulating aquastat (or outdoor reset) senses outdoor temperature and keeps the boiler water only as hot as needed. Brand-name aquastats sell for $150–350 and reduce fuel consumption by 5–10%. You can control an aquastat manually as well (see the section below on operating your system). Condensing boilers without these controls will not save energy, since they will operate at temperatures where no flue gas condensing occurs. Note also that some advanced “purge” controls for non-condensing boilers show performance rivaling that of less well-controlled condensing systems. With an outdoor reset control, the water temperature in a hot water boiler can be adjusted based on how cold it is outside. Time delay relay (hot water boilers only). Another strategy for controlling boiler water temperature is the time delay relay. When the room thermostat signals a need for heat, water heated earlier is circulated through the radiators without the boiler turning on. If circulation of warm water is not sufficient to heat the home within a specified time, the boiler burner fires to further heat the boiler water. With a time delay relay, circulation of lower temperature boiler water can provide adequate heating during milder weather. A time delay relay can be installed by a contractor for $50–75 and yield savings of 10%. Automatic vent damper. The automatic damper is a metal flap that closes off the flue when the burner shuts off. In practice, the electric vent damper is operated by the thermostat. In turn, opening the vent damper signals the boiler or furnace to turn on. This prevents the possibility of spilling combustion gases into the house if the damper malfunctions. Vent dampers cost from $125–400 installed and can cut fuel consumption by 3–15%. Savings are highest with steam boilers, large hot water boilers, and warm-air furnaces that are located in heated spaces, where heated room air can escape up the chimney during the off cycle. If the heating system is located in an unheated basement or if it has a flame retention oil burner, savings will probably be less than 5%. If you have an older oil burner, converting it to a flame retention type is generally a better investment (see “New oil burner installation,” page 92). 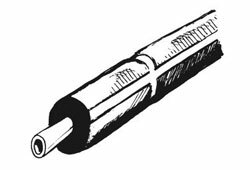 Caution: vent dampers are not suitable for all gas heating systems. Ask your service technician whether a vent damper is appropriate for your system. Adjustable radiator vents and valves. To reduce heat flow to unused rooms, valves on some hot water radiators may be turned down. Valves on steam radiators should always be completely on or off, not in between. An alternative for steam radiators is to install an adjustable air vent, typically costing about $10–15 at hardware and heating supply stores. These vents are screwed onto the radiator in place of existing vents, and they control how much steam gets into the radiator to heat it up. You can get even greater control with either steam or hot water radiators by installing thermostatic radiator valves. These valves allow you to select the temperature of each room. When the designed temperature is reached, the valve shuts the radiator off. These valves cost $50–125 each installed, and can be a less expensive way to create separate heating zones, compared to repiping the whole house. Programmable thermostats and “climate controls.” Setting the thermostat manually works well but is inconvenient. More convenient is a programmable thermostat that will turn on the heat a half-hour before your alarm goes off in the morning. Some programmable thermostats have several different set-back periods, helping you save energy when you go off to work and the kids leave for school. Programmable thermostats cost from about $40 to $150 for models that allow separate programming for each day of the week. Most will pay for themselves in about a year, if they are actually programmed properly and used consistently. This means several degrees of setback in winter and “set-up” in the air conditioning season. Unfortunately, many programmable thermostats have been hard to use, so many users have not realized the full energy savings possible with proper use. As a result, the ENERGY STAR program for programmable thermostats was suspended, but a new program for “Residential Climate Controls” is under consideration. The new program would qualify products that meet usability criteria and warrants investigation. Until that program goes into effect and there is good market availability of ENERGY STAR climate controls, ACEEE recommends shopping around for a unit with a programming interface that makes sense to you. 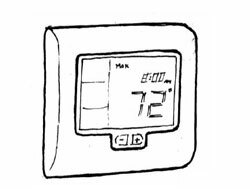 If your utility provides a thermostat to you through a peak-load reduction or other program, make sure the installer takes the time to walk you through the instructions so you can adjust the programming to meet your needs. Tankless coil water heaters. If domestic hot water is provided by your heating system boiler with a tankless coil, then during the summer, the boiler must operate constantly just to provide hot water for showers, washing dishes, etc. There are several ways to avoid this waste. The simplest but least convenient is to install a timer switch so that you can turn your whole heating system off at night and when you are away during the summer months. Another option is to install a stand-alone, gas-fired (or propane) water heater to use in the summer when your heating system is off. A third option is to install an indirect water heater that draws heat from the boiler (like a tankless coil), but stores the hot water so that the boiler does not need to run as frequently. This option is usually the most cost-effective alternative to tankless coils in cold climates. A fourth solution may be to buy a solar water heater. In most areas of the country, solar water heaters can provide nearly 100% of summertime hot water needs, thus complementing your wintertime boiler-produced hot water perfectly. Although this system requires a large capital investment, it is the best solution from an environmental standpoint, because solar energy produces virtually no pollutants, in contrast to fossil fuels and electricity. (See Water Heating.) If you are building a new house, but not sure if you’re ready to install solar water heating from the start, there are inexpensive steps you can take to support the installation at a later date. Plan for a south-facing roof and install “rough-in” plumbing; it will be cost-prohibitive to complete these retrofits later. You don’t need to hire a contractor to take care of all the energy saving modifications. All of these modifications deal with heat distribution— getting the most heat from your furnace or boiler to the rooms in your house. These should be done regardless of the tested combustion efficiency of the heating system. Pipe insulation. All hot water and steam pipes passing through unheated areas should be wrapped with insulation. Use specially made foam or fiberglass pipe insulation, which can cost $0.30–0.80 per foot and saves about $0.50 per foot per year. Try to use insulation with a wall thickness of at least 3⁄4" for fiberglass and 1⁄2" for foam. Do not wrap steam pipes with foam as it could melt. Older steam pipes may be wrapped with asbestos, which should not present a health hazard as long as it is well-sealed, not flaky, and not in a living space. If some of the white protective sheathing is missing, contact an asbestos abatement contractor. Secondly, all hot-air ducts passing through unheated spaces should be wrapped with insulation. You can use standard foil-faced fiberglass insulation, keeping the foil facing out and visible; vinyl-faced insulation made especially for ducts; or rigid foam insulation. R-8 is recommended in cold climates. Then, seal all joints or seams in the insulation. 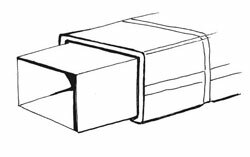 Use UL-181b duct tape with standard fiberglass batts and rigid foam; with vinyl-faced duct insulation, use duct tape or double-over and staple the seams. Radiator reflectors. Radiators are designed to heat the living space, but they can lose a lot of heat into the exterior walls they are installed against. You can reduce this loss by placing reflectors between the wall and the radiator. You can make reflectors from foil-covered cardboard, available from many building supply stores. The reflector should be the same size or slightly larger than the radiator. The foil should be periodically cleaned for maximum heat reflection. Setting the thermostat back at night will save a lot of energy and money. Insulate hot water pipes that run through unheated spaces. Be sure to use insulation that can withstand high temperatures. Duct installation is very important for ducts that pass through unheated spaces.